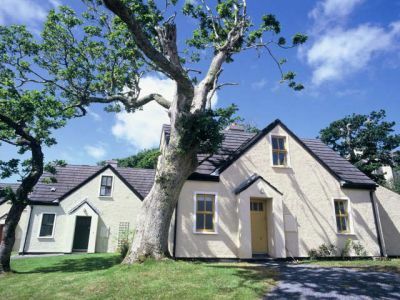 CLIFDEN GLEN,is a unique holiday village offering self-catering accommodation in Clifden. These three bedroom Lodges accommodate five people. Accommodation comprises a double bedroom with ensuite (located on ground floor), with a twin bedroom, single bedroom and bathroom on the first floor. Each Lodge includes a sitting room, complete with television and open fireplace, and a dining and kitchen area. Kitchens include a cooker, refrigerator, microwave and dishwasher, as well as all cutlery, crockery and utensils to cater for five people. Clifden Glen holiday village is a natural paradise with hill and river walks with spectacular views. Our guests can also avail of our three tennis courts, mini-golf, children’s playground and football ‘kick about’ area. Our Clubhouse is located in the original Clifden Lodge and its licensed premises is open at appropriate times in high season. Clifden Glen is set on 192 acres of magnificent natural environment of mountain, meadow and river with spectacular views of of the renowned Connemara landscape. Vistiors to Connemara can enjoy its beautiful white coral beaches, cliffs, picturesque fishing harbours and the breathtaking Twelve Bens and Maamturk mountain ranges. Connemara is a paradise for game and sea anglers, mountain walkers, pony trekkers, golfers, scuba divers, rock climbers, canoeists and sailors. Clifden Town is a truly welcoming town, which boasts a superb selection of pubs, excellent restaurants (with local seafood a speciality in most!) and a cosmopolitan shopping experience with the best of Irish designers located at The Platform and many antique and interior design shops. By night Clifden comes alive with music and fun and Market Square is the perfect place to soak up the atmosphere. Clifden Glen is ideally located on the coast between two different landscapes. To the south is a low lying terrain of bog and rocky outcrop, the beautiful white coral beaches, cliffs, picturesque fishing harbours and the Atlantic outposts of the Aran Islands. This is the Connemara landscape beloved of painters. To the north-east the region is dominated by the Twelve Bens and Maamturk mountain ranges culminating in the fjord of Killary. The area includes the wilderness of the Connemara National Park, the famous salmon fisheries of the Erriff and Delphi and the offshore island of Inishbofin. Connemara is a paradise for the game and sea angler, mountain walker, pony trekker, golfer, scuba diver, rock climbing, canoeist and sailor. Clifden Glen offers the freedom to relax and wander through a magnificent natural environment of mountain, meadow and river with spectacular views of the renowned Connemara landscape. Clifden Glen is located on the right hand side of the N59 as you approach Clifden, it is well sign posted. No 30 is located past the Club House to the rear of the development.